Suitable for medical personnel involved in the Ear, Nose and Throat(ENT) field. 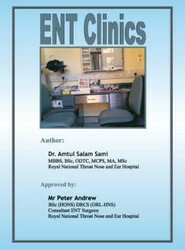 It offers complete guidance on diseases presented in ENT clinics, whether of ENT origin or otherwise. Ailments in ENT are comprehensively explained with a detailed analysis of one of the most prevalent conditions in ENT, on which the author has done specific research.